Another lie that continues is that once there is an affair in a marriage, there is no hope so you might as well divorce. I would not necessarily say that. There are different reasons that people have affairs. There are different temperaments that are more willing to forgive. There are different situations that need to be considered too. But I do know there is hope. I am a believer in Jesus, and I have seen some radically serious affairs that I thought there had no hope for and they did turn around. Then there are others that chose to never forgive and turn around. Each situation is different and we have to trust in God. He’s ultimately in charge, but He nor we cannot make a choice for another person. One of the things that I do not want to do is give people false hope, but I also don’t want to give them no hope either. It’s really tricky when working with affairs. There is no magic bullet. I have searched high and low for GREAT resources because this particular topic is close to my heart. One of my FAVORITE resources is Gary Chapman’s book http://www.5lovelanguages.com/resource/hope-for-the-separated/ When I went through this experience this is what I read over and over and over. I think it was a key in what helped me to heal from the heart break of rejection. Gary’s information is spot on to be able to move forward, give you hope but not false hope. I kept going for one year after I found out about my husband’s affair. I did not file for divorce for at least a year. I was really afraid of what I would do if I divorced too quickly. Eventually I had to file because there seemed to be no remorse on his part. But I have seen some people change, such as Clint and Penny Bragg, after eleven years. We have no idea how the ending will be. I do know that many couples still find themselves very attracted to each other after years of betrayal. 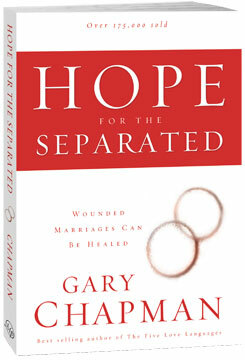 Gary’s book, Hope for the Separated, gives very specific direction on actions you can and should do to help the situation rather than hurt it. Many times we need some specific directions and guidance. When we go on our feelings, we don’t always make the best choices. By moving ahead with specific tasks it keeps us from getting wrapped up in our emotions and making choices on those rather than realistic expectations. I’m not wanting to make light of any affair and say that this is easy to recover from . I will tell you from my own experience that I’m still angry, sad, and rejected at times. I have moved forward, but those emotions are still there. I have chosen to remarry, and have been happily remarried for twenty-three years. God has been very good to me. But my choice is not the best for you, and I will tell you, there are times I question my choice. No matter what I know that “God Hates Divorce”. He doesn’t say it doesn’t happen, He knows that it HURTS greater than it helps. Does all this mean that you should keep in the marriage no matter what? NO, of course not. I have not walked in your shoes and no one else has either. My strongest advice is, “Don’t move too quickly”. You don’t know what will happen. The other advice I give, “Move cautiously! When they are trying to repent and when they are trying to leave. Watch and wait. Develop your relationship with God and see where you go from there. You don’t know what God has planned for you. Here’s one more resource. Beyond Affairs Networkhttp://www.beyondaffairs.com/ This site can also give you excellent direction. And my other favorite is Marriage 911 http://marriage911godsway.com/ Your Marriage Can be Saved. Would you let me know of any other really good resources. I greatly appreciate feedback.